After spending 2013 figuring out what to do with its various communication and collaboration tools, Microsoft’s focus in 2014 is not unified communications, but “universal” communications, executives said. 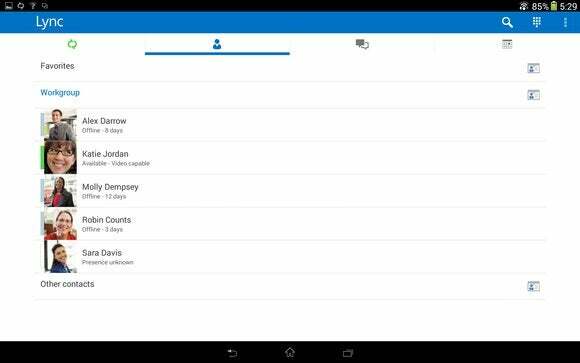 As the company opens its Lync Conference this week in Las Vegas, Microsoft executives said the company plans to fill a hole in its product offerings by adding Lync for Android tablets. Microsoft also plans to demonstrate video conferencing between Lync and Skype, resolving one major issue—videoconferencing incompatibility—when Microsoft linked the two last year. Microsoft’s goal is to allow customers to talk to others—whatever the app, whatever the platform. Although Lync and Skype share many features, Microsoft apparently will continue its tradition of pushing Skype at consumer applications, while using Lync as a business communications tool. For example, Giovanni Mezgec, the general manager of product marketing for Skype and Lync, said while Lync contacts will be able to conduct calls and videoconferences with someone on Skype, the Lync user won’t be able to share files. Nor will the Skype user be able to see a PowerPoint presentation a Lync user shares, in some contexts, Mezgec said. Still, Gurdeep Singh Pall, the corporate vice president for Lync and Skype engineering, acknowledged the convergence. 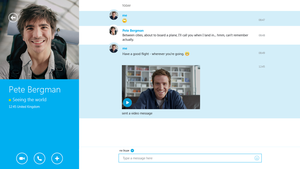 “We will bring these [Skype and Lync] experiences even closer over time to make it easier for people to communicate, both at work and in life,” Singh said in a blog post released in advance. 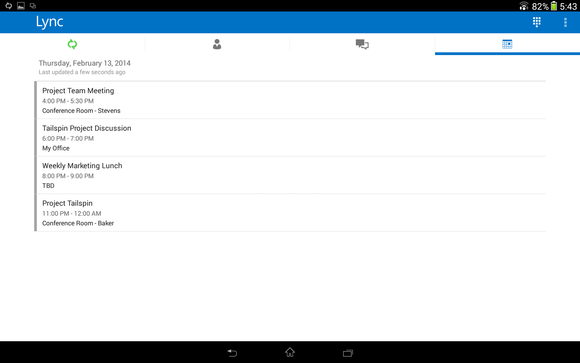 A pre-release version of Lync for Android shows the calendar view. Overall, however, the goal remains the same: Embed the communications experience on as many services and devices as possible, and allow customers to begin a conversation quickly and easily, Mezgec said in advance of the show. “We feel we’re at the moment at, where we’re delivering with video, and the integration of Skype and Lync, that we’re ready to take another step forward for the next five years,” Mezgec said. “And if I look at the past...we used to call this vision unified communications. That was because we had all this different communications modalities—telephony, conferencing, email—that we wanted to bring [to the user]. The next step is called universal communications. That means everyone, on any device, should be able to call our network or on the PSTN network. “It goes beyond delivery on devices, we want to embed the communications experience on as many services and devices as possible,” Mezgec said. Of course, one platform Microsoft has so far struggled to include has been the tablet, whether it be the oft-rumored Office for iPad or simply Android tablets. 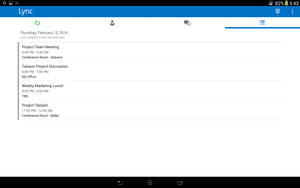 Adding Lync support for Android tablets (Android 4.0 and higher) fills that niche. Mezgec said Microsoft is betting on the cloud and Lync Online to help make contacts accessible on a variety of platforms. Microsoft will continue to work to ensure that PSTN calls can be made with Lync Online, the company said. So far, 10,000 unique domains have signed up to use the Lync-Skype integration, Microsoft said, as proof it’s moving in the right direction.